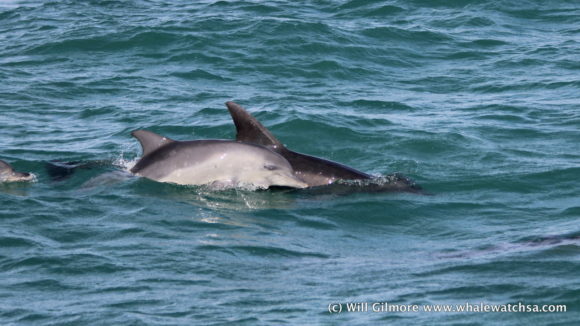 We had exciting time out at sea today, spotting not one but two different species of dolphin! With the new moon meddling with our tides a bit, we launched from Gansbaai harbour at around 10 this morning, making our way around the infamous Danger point, where over 300 soldiers lost their lives back in 1852. Whilst travelling, we spotted some beautiful Cape Cormorants sitting in the water. They often go out to feed in large flocks, providing a great spectacle for all who are privileged enough to see them. Only minutes later, we spotted some African Penguins. These endangered little birds have come all the way from Dyer Island in the hopes of finding themselves a meal. We call a group of Penguins a raft, with the birds travelling with other members of their species in order to practice the safety in numbers principle. Once we’d spent some time with the smallest member of the Marine Big 5, we set our sights on the shallows in the hopes of spotting a cetacean or two. 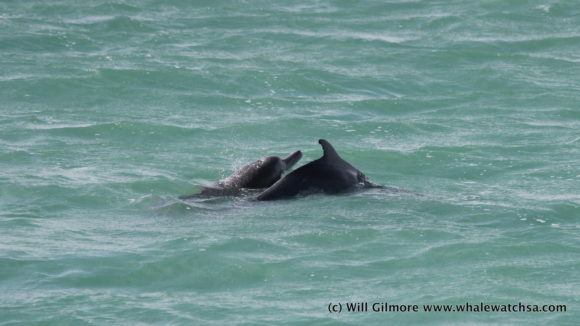 We were in luck, for as we arrived, we were greeted to the sight of two of our Humpback Dolphins. These two were really relaxed, so we were able to observe them for quite a while as they frolicked in the swell. As they cruised along the shoreline, they were joined by 3 more dolphins later on in the sighting. It’s very normal for us to find such small family groups around, with the maximum number of individuals in a pod usually not being more than 10 in our area. Our Humpback Dolphins underwent a name change a few years back, from the Indo-Pacific Humpback Dolphin to the Indian Ocean Humpback Dolphin, which better represents the species and their distinct gene pool. After doing some Dolphin watching, we took a quick stop by our sister company, which were unfortunately a little low on sharks. After explaining the operation, we moved over The Clyde reef System and towards Pearly Beach. Here, we happened upon a pod of Bottlenose Dolphins. These beauties where travelling slowly towards our bay, and we moved with them for a bit, taking in their grace as they moved effortless through the water column. After a while, the dolphins also came a little closer and began to move with the boat, much to the delight of all on board. 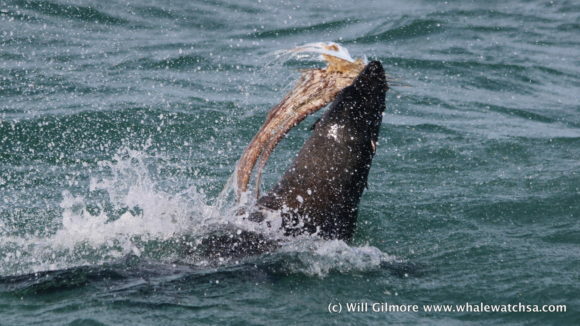 Our very last stop of the day was with our Cape Fur Seal colony. 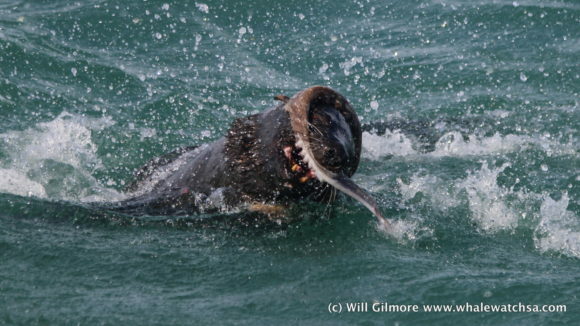 We moved into the famous Shark Alley just after noon and took in the sight of thousands of pinnipeds enjoying their home. Today, we had noticeably less seals in the water with the ones who did decide to venture in being a little skittish, which can’t help but make one wonder what predators might be lurking. 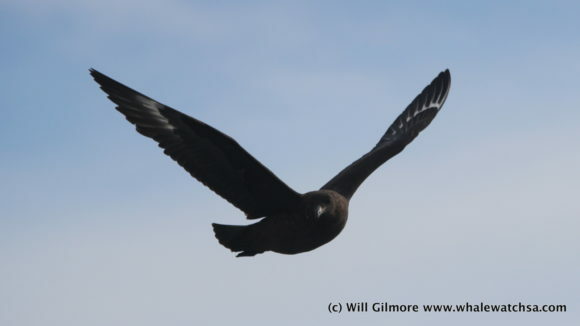 In the alley, we also spotted a Southern Giant Petrel moving into a bit of a perilous spot. Seals are known to investigate these large scavenging birds when they’re sitting on the water, so we were all thrilled when he came to his senses and flew off, hopefully to a slightly safer spot.